Bendigai - Me First. Car Second. UPDATE: Pir8jokes.com, the world's premier resource for all jokes pirate, is now taking submissions. Fill'er up! Thanks for the birthday wishes everybody! I had an incredibly fun weekend, the most fun I've had in the longest time. My birthday night Garbage concert was cancelled, doggonit, so Caireny and I were left to our own wits to find a suitable birthday activity. At the Cha-Cha we decided to head down to Ballard where Caireny would show me around, as she's had some experience there. The Robert-Smith-look-a-like we befriended assured me that Garbage wasn't meant to be, but something else was. Turns out he was very right. Ladies and gentlemen, in the late 70s nd early 80s, there was a band that changed music as we would know it forever. Ladies and gentlemen... we are... JOURNEY! And that's really the best birthday present I could ever hope for. To hear Anyway You Want It performed live. God it was great. That was their only song too, which I thought was pretty funny. Other bands covered Toto, Prince (an acoustic Little Red Corvette), and Bryan Adams. I think I went to school with the guy who did Bryan Adams - Nolie, was that you? Saturday night I went to the Rickshaw - a dirty little Chinese food place form the 70s, but one of the best destinations for Karaoke I've ever been to. It was great! Nancy gave an amazing rendition of Killing Me Softly, James impressed us all with Dancing With Myself, and I started a dance party with the Tom Jones classic It's Not Unusual. So much fun! We were dancing around, dancing with strangers, Science and Ohio-Jason acted out Total Eclipse of the Heart as a very active duet. Total fun. Later that night several of us restricted our speech to only caveman words. Me talk like caveman. Me also see accountant coworker at bar. Me think weird, me think out of context. Prior to that I went to a birthday party for my friend's one-year old Evee baby, and then to check out the Ballard Artwalk, featuring James! That is the third James I've interacted with this weekend. I even bought one of his smaller pieces (the one that says 'Mundane" under the Seattle photos area). Came with a free CD of his! I put it into CDDB, categorized under Easy Listening -> Lounge... hope that's ok.
My last fantastic event was today when I attempted to get into the sold-out Moisture Festival. 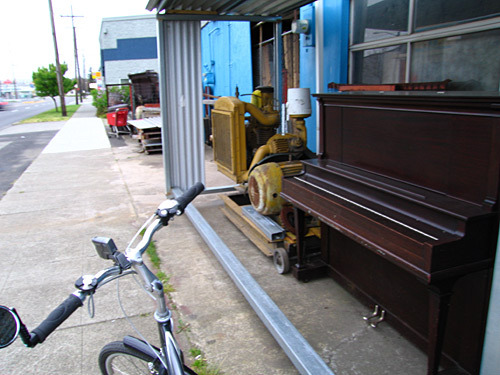 I was riding Spokey down in Frelard and saw a piano on the side of the road! I pulled over, looked to see if anybody was around, and started playing it. It was really worn and old, and a bit out of tune, but it was still a working piano. Shortly afterwards a man appears from nowhere and says "I caughtcha! I caughtcha red handed!" Then he tried to sell me the piano. It's actually a decent deal - it doesn't look like much, but he'd sell it for as much as it takes to weld something (I'm thinking no more than $200-300) and then needs to be tuned, which he says can be done from a guy he knows for $100. If I had a place for a piano to go I'd take it. He was the forth James I've interacted with this weekend, hiding behind the moniker of 'Jim'. The Ravioli Station is one helluva restaurant. They played Rocky Horror, Royksopp, and Duran Duran in the time I was eating there tonight. They have a heated bar! Now that I'm 23 I'm finding much more inspiration to get back into school, for a chance of getting a degree before I'm 30. Andrea's going to help tutor me tomorrow in preparation of a placement math test I must take - maybe I can start the process before the end of the month! That'd be good for me. 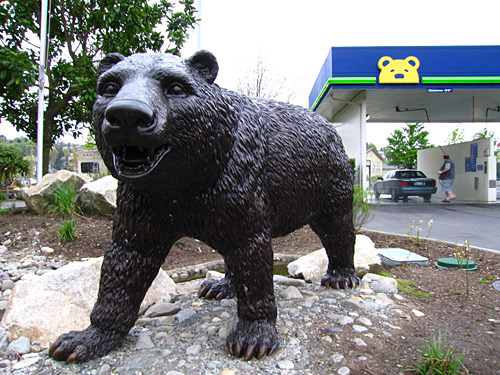 Carwash statuary at its best. The aforementioned piano. Spokey cameo. Oh you'll get yours Jason, you'll get yours! Oh man, I totally rocked your site finally, Mike. Finally, a problem for me to point out to you! Try to expand the text from my last comment. That Mike is always messing things up. James' site is www.argyleplaids.com for those of you who couldn't figure out Mike's typing perversions. Also, Andrea, you should make deathkills.perfe... [376 more to go] That Mike is always messing things up. James' site is www.argyleplaids.com for those of you who couldn't figure out Mike's typing perversions. Also, Andrea, you should make deathkills.perfect6ix.com your window to the world. There is a much better link section, and if you want crazy links, click on 'xml links' in the menu and be transported to a magical page full of every link I have bookmarked. All categorized, and updated whenever add/remove a bookmark. This has been an unpaid advertisement for deathkills.perfect6ix.com. Thank you, Mike. You typed Work James' link wrong. 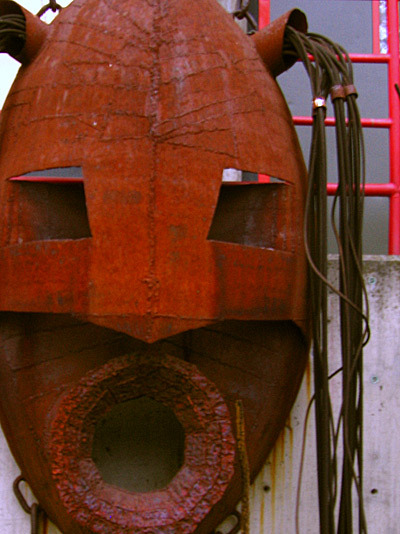 How will I buy affordable art for myself? Speaking of links, you should update your links page. I know there are more and better links out there than that, but since mike.karikas.com is my window to the world, I may never find them.